Fractal patterns are common in nature, including in the geometric patterns of a tortoise shell, the structure of a snail shell, the leaves of a succulent plant that repeat to create an intricate pattern, and the frost pattern on a car's windshield in winter. Fractals have the distinctive feature of a repeating geometry with structure at multiple scales, and are found everywhere, from Romanesco broccoli to ferns, and even at larger scales such as salt flats, mountains, coastlines and clouds. The shapes of trees and mountains are also self-similar, such that a branch looks like a small tree and a rocky outcrop like a small mountain. For the past two decades, scientists have predicted that fractal light could be created with a laser. With its highly polished spherical mirrors, a laser is almost the precise opposite of nature, and so it came as a surprise when, in 1998, researchers predicted fractal light beams emitted from a class of lasers. 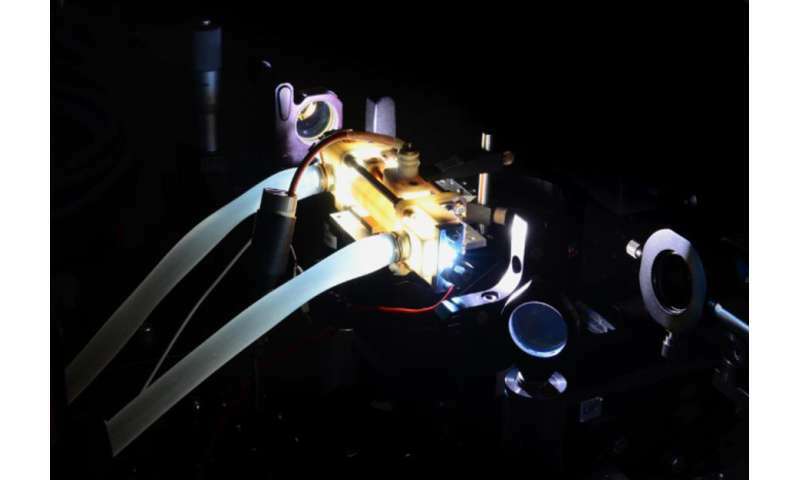 Now, a team from South Africa and Scotland have demonstrated that fractal light can be created from a laser, verifying the prediction of two decades. 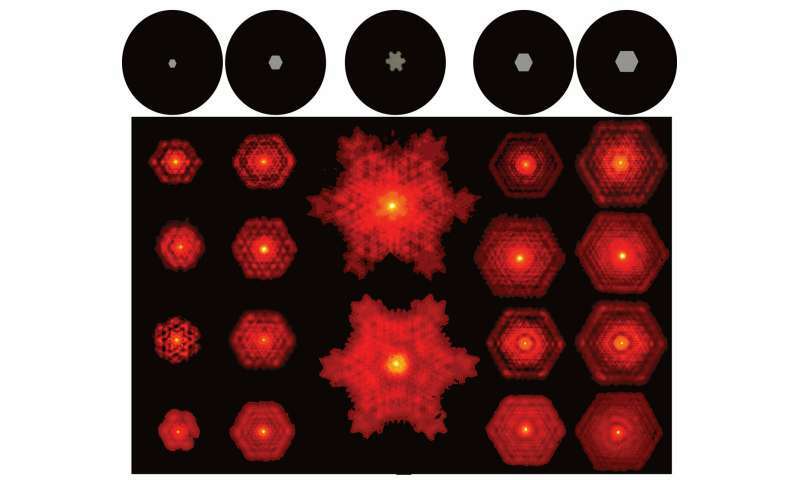 Reporting this month in Physical Review A, the team provides the first experimental evidence for fractal light from simple lasers and adds a new prediction: that the fractal pattern should exist in 3-D and not just 2-D, as previously thought. Nature creates such "patterns within patterns" by many recursions of a simple rule, for example, to produce a snowflake. Computer programmes also make fractals by looping through the rule repeatedly, famously producing the abstract Mandelbrot set. The light inside lasers also cycles back and forth, bouncing between the mirrors on each pass, which can be set to image the light into itself on each round trip. This looks just like a recursive loop, repeating a simple rule over and over. The imaging means that each time the light returns to the image plane, it is a smaller (or larger) version of what it was: a pattern within a pattern within a pattern. Fractals have applications in imaging, networks, antennas and even medicine. 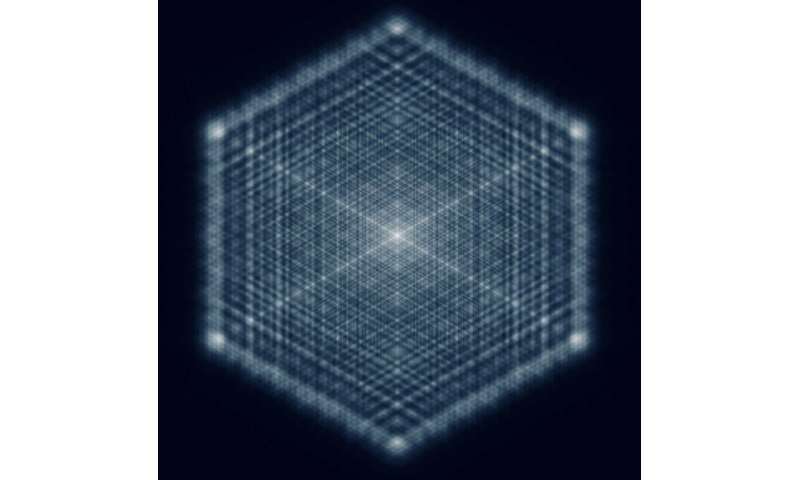 The team expects that the discovery of fractal forms of light that can be engineered directly from a laser should open new applications and technologies based on these exotic states of structured light. "Fractals are a truly fascinating phenomenon linked to what is known as chaos," says Professor Andrew Forbes from the University of the Witwatersrand, who led the project together with with Professor Johannes Courtial of the University of Glasgow. "In the popular science world, chaos is known as the 'Butterfly Effect,' where a small change in one place makes a big change somewhere else—for example, a butterfly beating its wings in Asia causes a hurricane in the USA. This has been proven to be true." The project combined theoretical expertise from the Glasgow team with experimental validation in South Africa by Wits and CSIR (Council for Scientific and Insdustrial Research) researchers. The initial version of the experiment was built by Dr. Darryl Naidoo (of the CSIR and Wits) and completed by Hend Sroor (Wits) as part of her Ph.D.